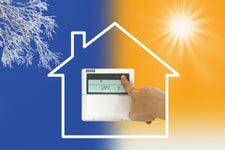 Twin Cities homeowners, landlords and property managers know that properly functioning heating and air conditioning systems are essential in Minnesota’s ever-changing weather conditions. Any time there’s a problem with these crucial systems, it can quickly become an emergency. At HandyQuick, one call to us brings qualified, trained HVAC technicians to your home or property to diagnose problems, make repairs, or to perform necessary maintenance. Our network of service providers includes top-rated heating and cooling experts, ready to respond to your needs. Furnace Repairs – Most problems with today’s modern furnaces can be quickly diagnosed and repaired by our fully qualified technicians. When one of our technicians arrives, he will pin down the source of the problem, using diagnostic techniques and equipment. Often any parts that are needed are already in his truck or van. If other parts are needed, they are readily available from local HVAC distributors. Before any repair work is done, you’ll get an accurate estimate of costs. Most repairs take only a short time, and your heat is restored. Air Conditioner Repairs – When air conditioners aren’t working correctly, our AC technicians have the diagnostic equipment and expertise needed to locate the problem quickly. Once the source of the problem is found, you’ll get an accurate estimate of the cost of repairs. Whether your system needs a part, addition of refrigerant, or some other solution, most repairs can be made quickly, restoring your comfort. HVAC System Replacement – In some cases, but rarely, a furnace or central air conditioning unit must be replaced. Problems like cracked heat exchangers or failed air conditioning compressors may require replacing the entire unit. In such cases, our technicians will quote you an affordable, fair price for the complete replacement. With your approval, the replacement can often be made the same day. HVAC System Inspection & Cleaning – All manufacturers of furnaces and central air conditioning equipment recommend an annual inspection and cleaning. HandyQuick’s HVAC technicians can perform these inspections and cleanings at highly competitive prices. If problems are spotted, a repair made at the time can save money on more expensive later failures. Air Duct Cleaning & Repairs – Call our home service company for your air duct cleaning needs. The air duct system in your home collects dust, mold, pollen, and other contaminants that can cause respiratory problems and increased dust in your home. A thorough, professional cleaning by our hand-selected air duct cleaning experts is affordable and eliminates those contaminants. At our Twin Cities handyman service, our clients know that we’re the only number they need for any issue with their home. Instead of searching on the Internet or in the Yellow Pages and calling a company that is unfamiliar to them, they call us first. Our extensive network of carefully selected specialists in all home systems, including heating and air conditioning systems, is always ready to respond to your needs. We’ve chosen only those specialists who meet our standards of integrity, quality, professionalism, and dedication to customer satisfaction for our clients. Call us for trusted, qualified, professional service, always at competitive pricing.